Clubroot was confirmed in 4 fields southeast of Calgary in the fall of 2018. 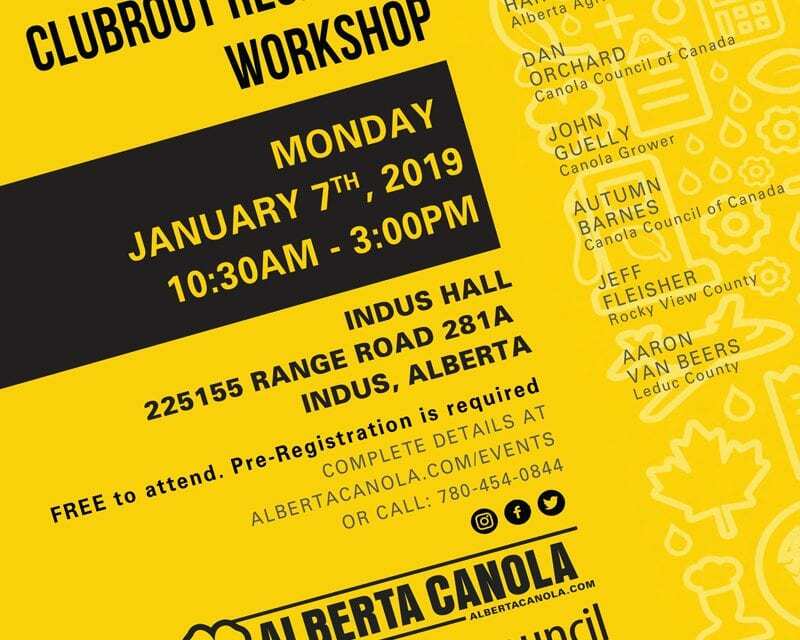 This meeting will help you gain a better understanding of the clubroot pathogen in the context of southern Alberta and teach you how to limit the impact of clubroot on your community. 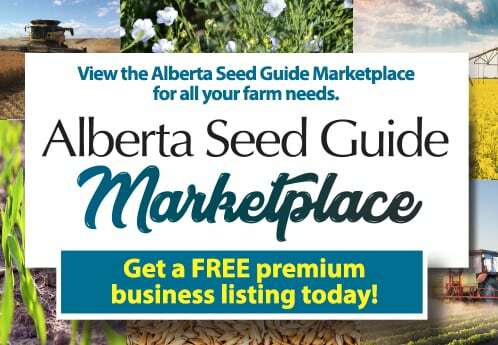 There will be plenty of time for discussion, and representatives from southern Alberta municipalities and seed companies will be available for questions throughout the day. Plant breeding wasn’t Dr. Habibur Rahman’s first interest. Indeed, Rahman initially thought he would get into the field of human or plant genetics. But a chance conversation with a family friend convinced Rahman to enter an agricultural university after graduating from high school, and the rest, as they say, is history. The eminent canola breeder first became interested in genetics when his high school biology teacher taught the class about the genetics behind human eye colour. Rahman attended Bangladesh Agricultural University, receiving his Bachelor of Science in Agriculture with Honours in 1980 and his Master of Science in Agriculture in Genetics and Plant Breeding in 1982. He completed his Ph.D. in Plant Breeding and Genetics at Royal Veterinary and Agricultural University (now known as Copenhagen University) in 1988. From January 1989 to September 2003, Rahman worked as a canola breeder/senior breeder with a Danish seed company, Danisco Seed. During this period, he developed (solely or jointly) 47 spring and winterBrassica napus canola, high-oleic and low-linolenic acid canola, and high erucic rapeseed cultivars for European and North American markets. At one time, one of his winter canola cultivars, Aviso, captured about one-third of the French market. This cultivar has been used as check for blackleg disease resistance by the French official authority. In 2003, Rahman accepted a position to teach and lead the canola program at the University of Alberta (U of A). At the time he joined the university, clubroot emerged as a threat to canola production in Canada. He immediately began work on finding solutions, identifying clubroot-resistant Brassicagermplasm, introgressing resistance into Canadian B. napuscanola, mapping some of the resistance genes and, in collaboration with an industry partner, developing the first clubroot resistant canola cultivar carrying multiple clubroot resistance genes. Over the past 15 years, Rahman has continued his mission to improve canola for Alberta and Canadian crop producers. He introgressed exotic genes/alleles from different exotic gene pools, such as European winter canola, Chinese semi-winter type and rutabaga, and allied species, such as B. oleraceaand B. rapa, into Canadian canola, and developed a canola cultivar by the use of genetically diverse materials. And he contributed to the knowledge of the value of different gene pools for increased seed yield in hybrid canola cultivars. Introgressed earliness of flowering from the C genome of the late-flowering species oleracea(Chinese kale) into B. napuscanola and mapped the flowering time genes and established their association with seed yield for use in breeding. Identified the B genome chromosomes of carinatathat carry resistance to blackleg disease for the introgression into B. napuscanola. Developed different fatty acid mutant lines of oleracea, including low-linolenic acid (C18:3), and characterized the C18:3 mutations at sequence level for use in the breeding of B. napuscanola. Mapped several agronomic and seed quality traits and identified molecular markers for use in marker-assisted breeding. Developed more than 120,000 SSR markers from the BrassicaA genome for use in breeding. Developed (solely) four additional canola cultivars for commercialization in Canada. Rahman says the continued evolution of plant breeding has been a boon to the industry. When he entered the plant breeding field, he said only the most traditional plant breeding techniques were in place. 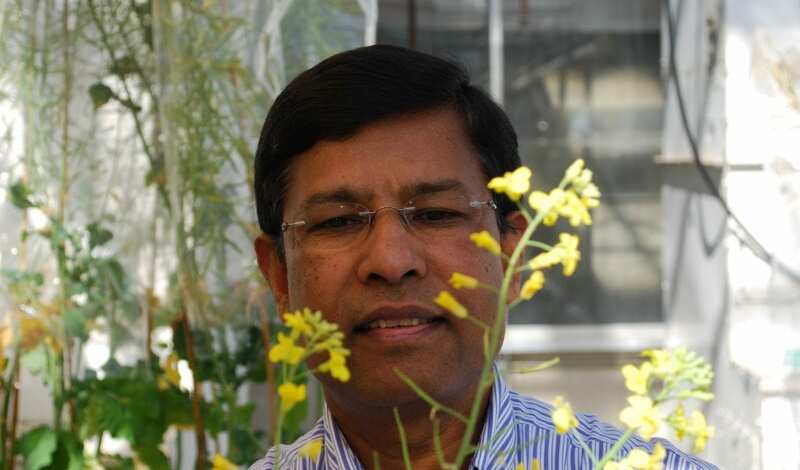 Other changes Rahman has seen during his career are the development and use of transgenics traits, and the development of hybrid canola cultivars. As science continues to grow by leaps and bounds, Rahman says we should see more integration of molecular markers and genomics tools in breeding of crop cultivars. 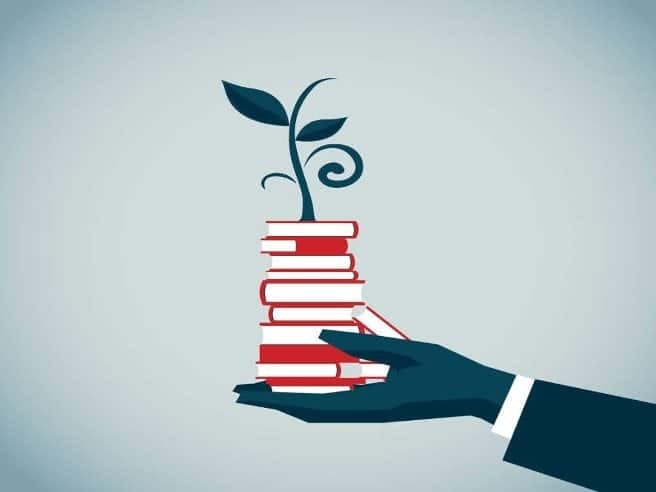 When he’s not in the lab at the U of A, Rahman teaches an undergraduate plant breeding course, Genetic Improvement of Crop Plants, and the graduate course Plant Breeding. He has also been teaching the graduate course Seminar in Plant Science. Over the past five years, he’s graduated nine M.Sc. students and over the course of his 15 years at U of A, 13 M.Sc. and two Ph.D. students. He currently supervises four M.Sc. students and supervises or co-supervises four Ph.D. students. He also supervises two postdoctoral fellows, two research associates and three technicians. Since joining the U of A, Rahman has published 45 papers in refereed journals and eight papers in conference proceedings (over his lifetime 65 papers in refereed journals, 14 in conference proceedings and one book chapter). He has received several research grants as principal investigator or co-principal investigator for conducting breeding research on canola in the areas of clubroot and blackleg disease resistance, genetic diversity and heterosis, earliness of flowering and maturity without yield penalty, clubroot and blackleg disease resistance, yellow seed colour and seed meal quality, fatty acid profile of oil and increasing seed oil content. There’s no doubt Rahman possesses strong academic and commercial plant breeding expertise, and the combination of these two makes him a very unique plant breeder. He has made huge contributions to plant breeding research, to training of the next generation of plant breeders, and has made important contributions to the practical application of research for the development of commercial cultivars. Despite a highly-successful plant breeding career, Rahman isn’t slowing down. He’s got plans and dreams. “I hope to have more money and more time to do more research to integrate molecular tools in breeding,” he says. “And I’d like to see all students include a molecular component in their research and integrate this with breeding. Clubroot has been identified in canola southeast of Calgary. 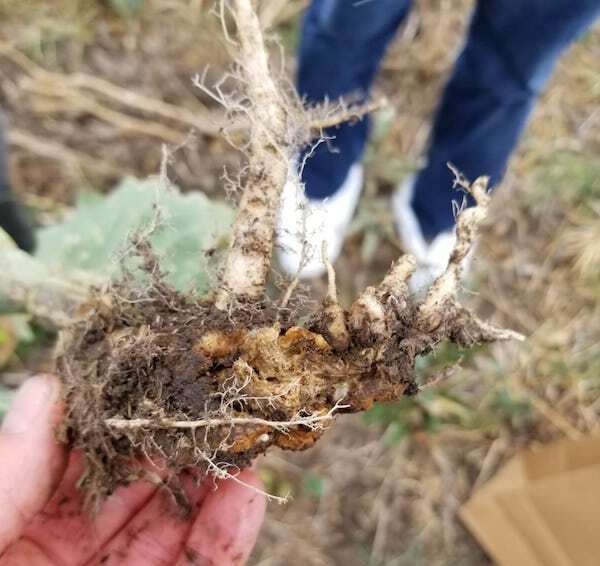 Although clubroot has been found in various counties in Alberta since 2003, this is the first year the disease has been confirmed in Rocky View County. This fall, southern Alberta canola growers should be especially diligent in scouting their canola fields for clubroot and should consider deploying resistant varieties in future canola production cycles. Identifying clubroot as early as possible and keeping the pathogen’s spores from spreading are important steps in long-term clubroot management. With early detection, growers can take steps to contain and minimize spore loads and protect their fields. ANY method of soil movement can move the clubroot pathogen’s spores, such as tillage, dirt/dust on equipment and straw, wind or water erosion, and even animals. Under high disease pressure, above-ground symptoms of clubroot can include stunted growth, wilting and premature ripening. These symptoms should not be mistaken for drought stress, which was common throughout southern Alberta this year. Start looking for the disease around field entrances and in areas with higher moisture or where soil movement may have occurred in a field’s history. Proper diagnosis should always include digging up plants to check for gall formation on roots. This time of year, many galls will likely have matured and decomposed into a peat-moss-like (or sawdust-like) substance around roots. If growers or agronomists find galls or a substance that looks like it might have been galls, samples can be sent to a lab for proper diagnosis. Find the labs list at clubroot.ca. The ideal goal for safe long-term storage is to have canola rest in the bin at 8% moisture and less than 15°C. No matter how good the harvest weather or how dry the harvested crop, all canola should be conditioned after it goes into the bin. For tough and damp canola, the spoilage risk is much higher. Canola is considered “tough” at moisture levels between 10% and 12.5%. “Damp” is anything above that. With tough canola, aeration with adequate airflow can be enough to dry it to safe storage levels as long as air has capacity to dry: warm with low relatively humidity (RH). At RH values above 70%, the equilibrium moisture content will be above 8% to 9%, meaning sufficient drying for safe long term storage is difficult to achieve. Drying canola with aeration alone also requires sufficient air flow* and time to move the drying front to the top of the grain mass. Damp canola will require heated air drying and rigorous management to condition it for safe storage. Dry canola as soon as possible. While waiting, aerate continuously if possible and move damp canola back and forth between storage facilities to prevent spoilage. The combination of aeration and movement is ideal. Have the right equipment. Continuous flow or re-circulating batch drying systems are preferable. They reduce the potential for seed damage from heating and allow for slightly higher drying temperatures. For very damp canola, growers may prefer to run the grain through twice at a lower temperature to prevent seed damage and reduce the risk of fires. Also, if the dryer has screens, make sure the screen size is small enough to hold canola. Another option is to add heat to a bin aeration system. Talk to your bin and fan supplier for details. Watch drying temperatures. Check the maximum safe drying temperature for your system, then reduce it by 11°C when working with damp canola as opposed to tough. As moisture content increases, it gets much easier to “cook” your canola in a heated air drying system. Over dry canola slightly when using heated air. As grain cools when moved into storage, moisture content tends to rebound slightly. Over drying compensates for this. A general rule is to over dry by 0.1% for every point the grain is dried. For example, if canola is at 14% moisture and your target is 9%, over dry by 0.5 percentage points to 8.5%. When returning warm, dried canola back to the bin, turn on the fans to cool it for safe storage. This could also allow for a bit more drying as drying can occur when cold air is introduced to a warm mass of grain. Natural air drying (NAD) using aeration fans with adequate airflow can work as long as air has capacity to dry. NAD for tough or damp canola is not usually effective under late fall conditions when canola and outside air are both cold. In these conditions, reaching dry equilibrium moisture levels often takes too long to avoid spoilage in many cases. A heater added to an aeration fan. Adding heat to an aeration system. The general recommendation for this method is to increase air temperature to no more than 15-20°C. PAMI storage researcher Joy Agnew notes: “Hotter is NOT always better when using natural air drying with heat. You must match heat addition with your fan capacity. The more cubic feet per minute the fan blows, the more heat you can add. With typical NAD fans, a temperature increase of 10-20°C is max.” Also ensure fan airflow rate is sufficient for moisture removal — 0.5 cfm/bu or higher. Ensure the air is heated adequately. There’s no point in heating air if the amount of temperature increase won’t accomplish drying. Temperature of the grain itself plays a role in the efficiency of NAD and NAD with supplemental heat. If the grain is already cool (less than 5°C), NAD and NAD with supplemental heat will initially add moisture to the grain; it will take some time before drying starts, but the bulk will warm up eventually and drying will be accomplished. If the grain is still warm (close to the temperature of the air you are introducing into the bin), then NAD plus supplemental heat can work very well. Increasing the temperature of the incoming air basically reduces the relative humidity (RH) of the incoming air (or increases the capacity of air to hold moisture) which will increase its efficiency of drying the grain. For every 10°C increase in air temperature, the RH is cut in half. Can your fan move enough air? 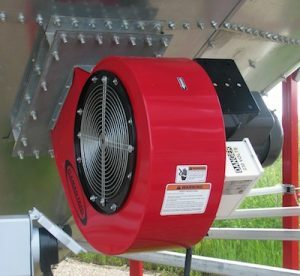 When conditioning tough or damp canola, make sure your aeration fan has the horsepower to work effectively. Insufficient air flow can result in a high moisture zone near the top of the bin that can initiate spoilage. 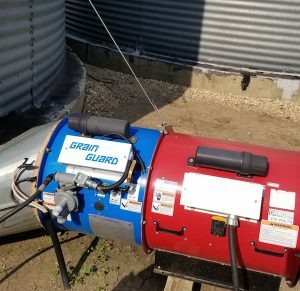 If the fan can’t move enough air, take out some grain. The greater the depth of canola in the bin, the more fan capacity you will need to move air through it effectively. Large diameter bins that provide uniform air flow through a perforated floor may have an advantage when handling damp grain. If you suspect the air flow is insufficient, remove some canola to reduce the depth. This offers two other benefits: It disrupts any high moisture areas that are developing. And it can flatten the cone, making the depth of grain more consistent throughout the bin. Ventilate the bin. Proper ventilation at the top of the bin to allow for escape of the warm moist air is very important, especially for large bins and especially when adding supplemental heat since the moisture removal rate is so much higher when heat is added. Inadequate ventilation in the headspace will result in condensation on the top layers of grain. What about blending dry and damp canola? If considering blending in an attempt to bring damp canola down to tough, be very careful. It is possible you could just be putting your dry canola at risk, as the transfer of moisture from seed to seed is a slow process. Monitor regularly. This is good advice for all canola. Be extra careful with canola that goes into the bin warm and tough this week. *PAMI ran a trial in wheat comparing two bins using 0.1 cfm/bu, two bins using 0.5 cfm/bu and two bins using 1 cfm/bu. All bins started with the same temperature and moisture content (17%). Bins with 0.5 and 1 cfm/bu air flow ended up between 14% and 15% moisture, but the bin with 0.1 cfm/bu lost very little moisture and ended up around 16.5%. 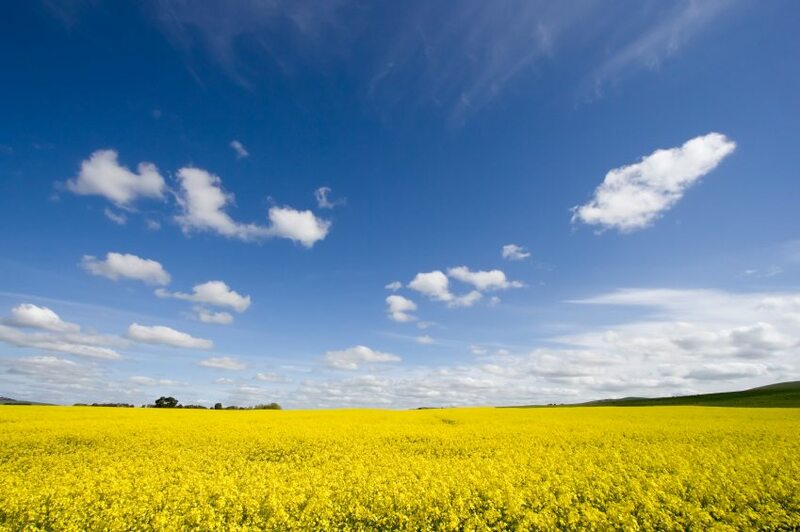 Canada’s canola sector is strong and growing. In 2016, Canadian canola seed and oil exports accounted for almost 15 per cent of total agriculture and food exports, valued at $9.2 billion. Canola has also been the largest crop in Canadain terms of market receipts since 2010, and accounts for more than one-fifth of all Canadian cropland. 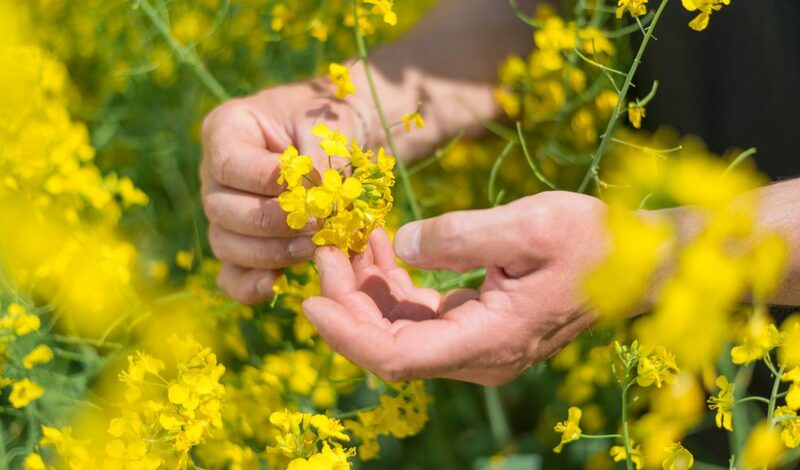 The Government of Canadaknows that research and innovation are vital to ensuring Canadian canola farmers have a sustainable and profitable future. While visiting the Bruce D. Campbell Farm & Food Discovery Centre, Lawrence MacAulay, Minister of Agriculture and Agri-Food, announced up to $12.1 million in funding to the Canola Council of Canada under the Canadian Agricultural Partnership, AgriScience Clusters. Building on the work of two previous clusters, this research investment includes an additional industry contribution of up to $8.1 million. The cluster will focus on advancing the growth and profitability of the sector through innovative and sustainable approaches to creating new and improved products. Activities will include adapting food processing techniques, exploring uses for canola meal in livestock production, examining practices to optimize yields, protect crops from pests, and share lessons learned with stakeholders. The Government of Canada is also continuing to support new markets for the canola sector. 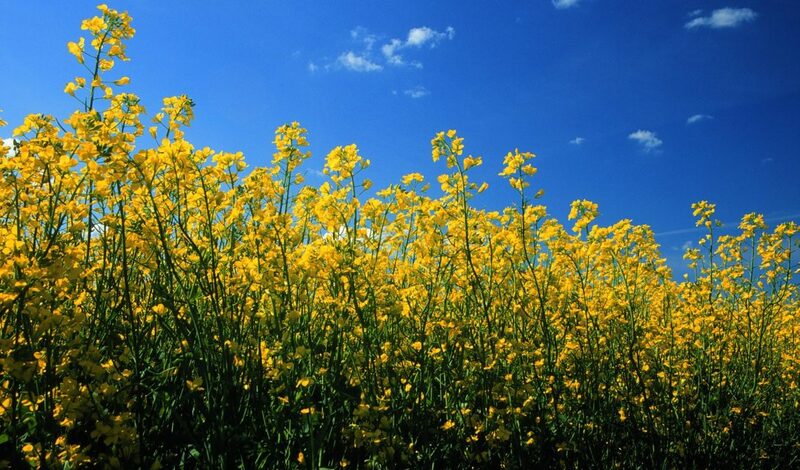 In 2016, Canada reached an agreement to secure canola trade with China, which allows for exports of canola seeds under existing commercial terms until March, 2020. Exports of canola seed to China continue to increase reaching $2.6 billion in 2017. In addition, in June 2018 the Government introduced legislation to implement the Comprehensive and Progressive Agreement for Trans-Pacific Partnership (CPTPP), which will further help to open markets and increase exports. The announcement is part of Minister MacAulay’s “Growing Canadian Agriculture” tour, where he will meet with farmers, processors and industry leaders, and participate in rural agricultural events across the country, to hear ideas on how to capture new growth opportunities for the sector. Frost Hits Canola. Do I Swath? This is the question for many canola growers Sept. 4 as frost (in some areas heavy and long-lasting) hit parts of Alberta over night. —Check standing canola the morning after a frost. —Before taking any action, wait 4-6 hours after frost to allow the full extent of frost damage to become evident. The crop may look undamaged in the morning but by the afternoon wilting, desiccation and pod splitting may begin. This crop may need to be swathed to preserve yield, but keep in mind that high green counts are likely. —Light to moderate frost damage may take longer to show up. If no damage is evident after the first day and you decide to leave the crop to mature more fully, scout again after 2-3 days to reassess. Heavy frost… below -2°C: Assess the damage in early afternoon. Check pods for a white, wilted appearance. Pod shatter and pod drop could begin within a day, especially with warm sunny afternoons. If pods are desiccating rapidly, swathing right away will preserve as much yield as possible. For canola with high seed moisture, frost in excess of -5°C is generally lethal, resulting in non-viable seed. At such low temperatures, ice crystals physically disrupt structures such as membranes and enzymes. Pods of immature canola crops frozen at lethal temperatures have been observed to turn black, whereas mild frost turns pods white or white-speckled. —If the majority of the seeds remain green and immature, delay swathing to allow for further seed maturity. —If the pods are severely damaged and are beginning to desiccate, swath during periods of dew or high humidity to reduce the amount of pod shelling and pod drop.